“You probably won’t see any smiles until the second or third day,” warned Jen French, Founder of the Warrior Sailing Program. I had volunteered to serve as the program’s photographer for the three-day Annapolis event in mid-October, and French was briefing me on the importance of getting portrait shots of each of the 21 participants. I didn’t have to wait long, though, to capture some wide grins the very first day. 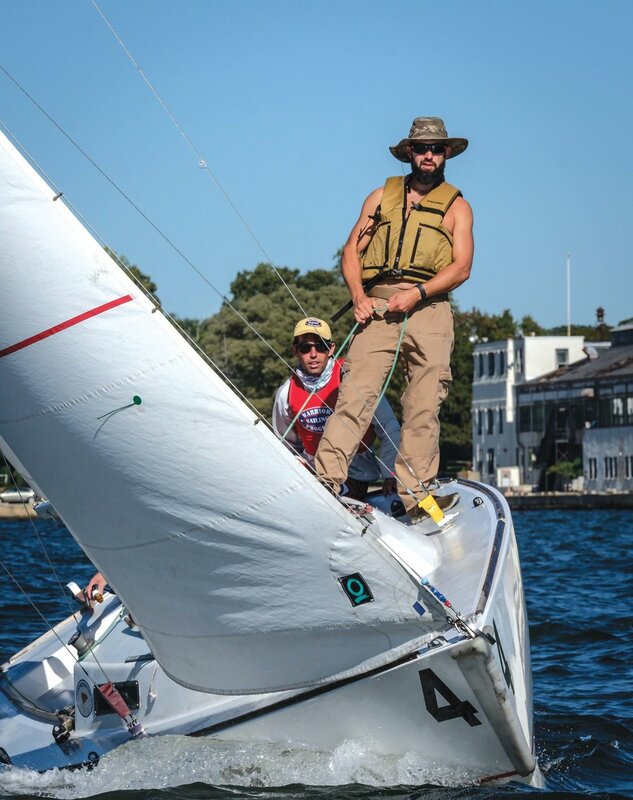 Founded in 2010, the Warrior Sailing Program runs sailing training camps designed to introduce the sport of sailing to wounded, injured and disabled service members. Held in popular sailing towns such as St. Petersburg, San Diego, Charleston, Newport and Annapolis, the program stresses the importance of teamwork and self-reliance while emphasizing the fun of learning to sail. As part of the USMMA Sailing Foundation, a 501(c)(3) organization, the Warrior Sailing Program relies on corporate and private donations for its funding, which goes directly to teaching its participants the skill of sailing. Participants are recruited through various VA and military adaptive sports programs as well as word-of-mouth. 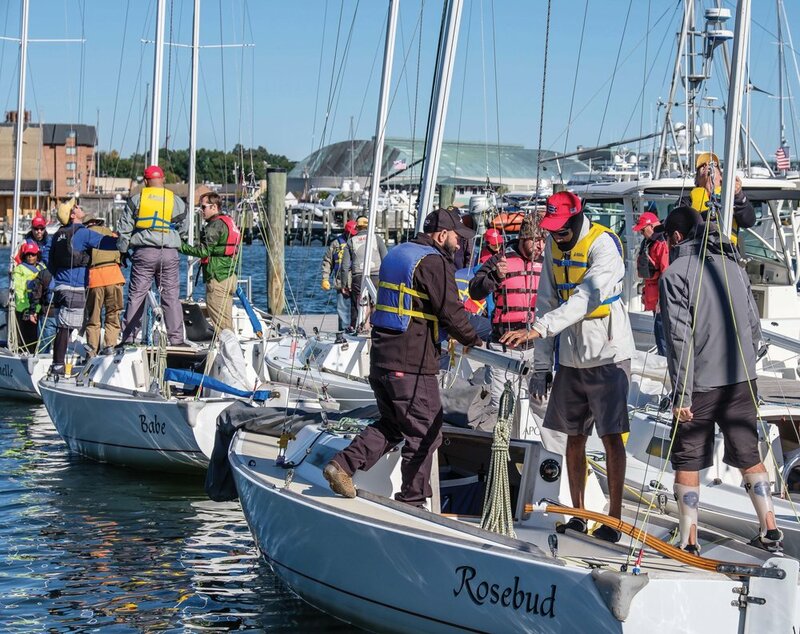 As it did the year before, the Annapolis Yacht Club sponsored this year’s event, with additional support coming from several local businesses and organizations. Program participants were immediately put at ease during the first classroom session, run by the instantly likable Program Director, Ben Poucher. Drawing simple diagrams of boat parts and wind direction on his whiteboard, Poucher interjected humorous anecdotes and fun sailing stories as he taught the novice sailors the basics of boat handling and sailing. While Poucher’s lively whiteboard instruction is effective, he more clearly demonstrated the intricacies of sailing theory by taking his class outside to a parking lot. Here, he had a small sailboat rigged and set up on a lightweight trailer that he maneuvered through a 360-degree circle. Wheeling the boat into the wind, he showed how the sails react and why the boat will come to a stop. Wheeling, or falling off 45-degrees, Poucher demonstrates how the sails fill and the importance of trimming the sheets. Wheeling past 180 degrees, he explained what a jibe is and shows the need to control the boom with the mainsheet. Whatever his students didn’t grasp in their classroom session was quickly understood with this visual, hands-on approach. whom I was dealing with. These were tested military veterans, accustomed to performing difficult and dangerous tasks. Jen was right about the non-smiles, at least at this stage. As the fleet of J/22s (with no auxiliary propulsion) caught the breeze and headed out with one warrior at the helm, one handling the main sheet and one on the jib sheet, each had a look of sheer determination. These veterans were not only going to learn how to sail, they seemed intent on learning how to sail well. After all, the three-day program was to culminate in a competitive poker run across the Bay, and they already seemed focused on winning. Following the fleet of seven boats in my Whaler, I watched how the coaches stood at the mast, giving instructions and calmly explaining the job of each crewmember. Each day included two sailing sessions of two hours, with crewmembers rotating positions, learning to function as a team and handling their boats with surprising skill. By the second day, the vets were visibly relaxing, becoming more comfortable and confident. By the third day, they seemed ready and anxious to compete. Indeed, a number of graduates go on to more advanced sailing programs. One of the coaches in this year’s Annapolis program, himself a wounded warrior, started as a participant four years ago. A female veteran who participated in a 2016 sailing camp has since crewed in the Blind Nationals and Blind Worlds and is currently training for both single-handed and crewed national events. Another graduate went on to attend a number of ASA classes and has taken his family cruising offshore on a Hunter 466. Others have caught the sailing bug and have become regular crewmembers on yacht club racing teams. During the final night’s awards dinner at the Annapolis Yacht Club, I overheard a few comments that summed up the effectiveness of the program. “Maybe I can’t run anymore,” said one veteran, “but now I can sail.” “I forgot about my pain,” reflected another participant. “I got to be normal again.” Photographing these proud men and women was an honor—but perhaps the greatest honor was watching them find a sailor’s confidence, freedom and solace on the water. George Sass is a happily retired ad- man, award-winning writer/photographer, and accomplished mariner with more than 50,000 nautical miles in his wake.